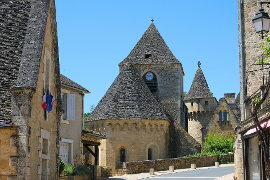 Terrasson is a lovely town with blue slate rooves on many of the buildings, unusual in most of the Dordogne region. 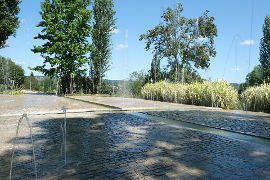 These can be best appreciated from the Jardins de l'imaginaire (see Dordogne gardens section) - these renowned gardens are a big attraction in Terrasson and should not be missed. But don't forget to look around the town as well - it is very worthy of exploration. 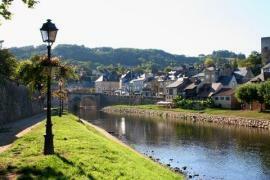 The town sits either side of the river Vezere. On one side is the newer part of town with most of the shops and also the place where the market takes place. Market day is Thursday and sits on the edge of the river - a lovely setting on a sunny morning. Over the river is the old town. 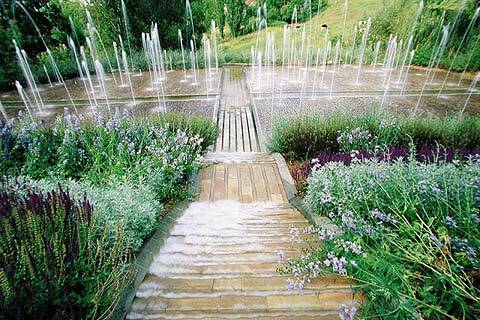 Head uphill towards the right (with the river behind you) and you have the stunning Jardins de l'Imaginaire. 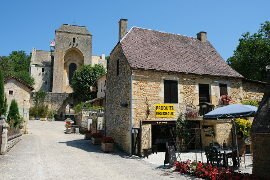 Continue uphill and to the left and you enter the old town of Terrasson. This area is not huge but it is very attractive. The old town is all paved and cobbled and largely pedestrianised. The walls are a pale creamy stone and the rooves a grey slate. Mostly the houses are stone but some are half-timbered and all are in different styles providing an interesting mixture of styles. The highlight is the Place Bouquier about halfway up the hill. 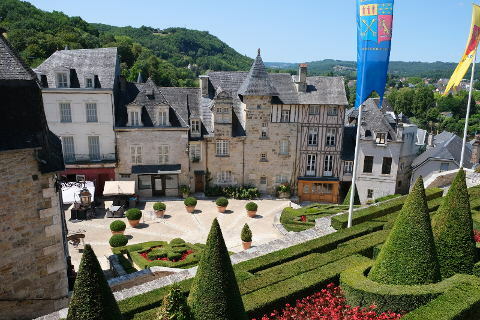 This has some fabulous buildings on it and also a gardened area leading up to the abbey church above. Notice the coat of arms made of pebbles and tiles and set into the floor. Look out for the Rue de la Marzelle which has a wonderful building with a tall stone pillar surrounding a half-timber building. Continue up to the church and from here you get some stunning views back down over the Place Bouquier and the surrounding town. The original church was destroyed in the Hundred Years War and then in a period of prosperity in the 15th century the abbey church was rebuilt - this time in Renaissance style. Much was again destroyed in the Wars of Religion. The outside has been renovated and now a big renovation job is going on inside. 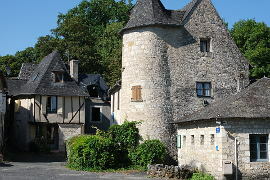 Behind the church is the Chateau Seigneurial and the remparts. Another of Terrassons highlights is its 12th century stone bridge crossing the river. 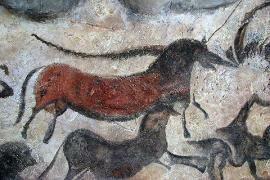 The superb Lascaux caves are only a few kilometers from Terrasson and it would be a great shame to miss them. 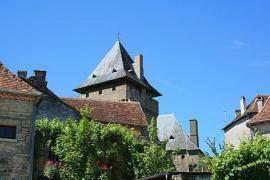 These can be found from the town of Montignac which is a very pretty small town on the edge of the river Vezere. The Chateau de Hautefort is also close by.